Pride and Prejudice isn’t my favorite Jane Austen novel. Neither is Emma. It’s not even Sense and Sensibility or Northhanger Abbey. For the record, it’s Mansfield Park, but a close second is Persuasion. So when a new book came into the library and was described on the jacket as a dystopian/post-apocalyptic spin on Persuasion, I was immediately smitten. 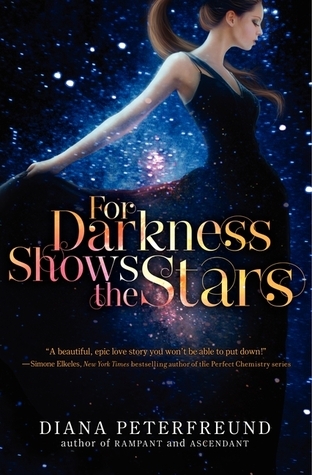 And I was certainly not disappointed by For Darkness Shows the Stars. To be fair, this book seems to have been written with someone like me as it’s target audience. I didn’t read much young adult literature when I actually was a young adult, but I read all of Jane Austen during high school. Now that I read (and enjoy) YA, my taste tends to favor science fiction and fantasy, so this hit two of my sweet spots as a reader. Maybe it has something to do with the protagonist’s name: Elliot. She’s named after her grandfather, and it’s deliberately meant to be a boy’s name. My favorite Nancy Drew character was her friend George. I like gender-neutral names, and love gender-defying names. But no, it isn’t just her name. Elliot is everything Ann is in Persuasion: endearing, dedicated, true. She doesn’t deny her emotions, she just realizes their is more to the world than her own feelings. As the main character, she was certainly the most developed, and I genuinely liked her. As far as science fiction goes, this is definitely what I’d call “sci-fi lite”. There’s not a lot of development of the “how” of the world—it’s clear that genetic manipulation is what contributed to the demise of a good portion of the population, but there’s no hard science. It’s not the details that the story relies on, however; the idea suffices. The slow way the past is revealed allowed it to serve as a background to the romance. And the romance is what will keep readers turning pages. Though the story is set in the future, the old-fashioned ideas of class and courtship play out in an excruciatingly delightful way. Will Elliot and Kai get together, like they most certainly would if it was truly a Jane Austen novel? I was on the edge of my seat waiting to find out. In young adult literature, the romance is often a tale of boy meets girl. There is instant attraction, then they battle their family/evil overlords/zombies/etc. together, so it was refreshing to read a story that starts years after the protagonists fell in love. Rather than sacrificing the tension, this configuration magnified it exponentially. Though we don’t get so much as a kiss between Malakai and Elliot, the tension and angst surely don’t suffer. I recommend this book for those who like their YA romance with a side of dystopia and a sprinkling of sci-fi. Next: Next post: Live with it. “Though we don’t get so much as a kiss between Malakai and Elliot…” I thought Peterfreund was taking the Jane Austen blueprint a little too far when she denied them a kiss! I remember being like “what! ?” when there was no kiss and feeling cheated, but you know, there are PLENTY of YA novels with lots of kissing. And it’s nice to have some that don’t, especially for readers who specifically don’t want an overly mushy plot.